Sounds like the answer is obvious but just to be super-clear, the Julep cream is 100% for the whole foot and its claims are to give noticeably smoother feet in 1 to 2 uses. Julep's cream "contains AHA's for exfoliation" which helps re-build and change the skin faster if I understand it correctly and the cream "hydrates with shea butter and coconut oil, nourishes with essential oils and vitamin E" (taken from the packaging, edited to enter it grammatically into my phrase). The Alessandro cream specifically talks about heels, though it is a foot cream that can be used for the whole foot. It is more specifically for rough and dry feet. It's less descriptive on its packaging so I'll do some of the work for them. I see in the ingredients list that they also have shea butter and all sorts of interesting extracts (leaf, fruit, sandlewood) but to be fair, so does Julep. This cream has more of the acids in them and I'm not sure if it's the good kind (like glycolic acid which Julep has). Julep wins it on the ingredients as far as being easier to understand and feel comfortable with but that doesn't mean much... I'm not knowledgeable enough yet to give a good idea of how good the whole of the Alessandro ingredients are. What you should have gotten out of this section is: Alessandro might be more suited to dryer feet while Julep's is best to help more "normal" feet. I liked both creams quite a lot, but in different ways. Both of them made my feet feel noticibly softer and smoother and they both answered Julep's claim to make feet smoother in 1 to 2 uses. The biggest difference between both creams was that while the Julep cream was a bit greasy, the Alessandro was not in any way. This category goes to Alessandro for being both efficient and not leaving any greasy feeling whatsoever. The Julep cream is a cucumber-mint fragrance. I kind of hate cucumber smells but I LOVE this one. Alessandro's is more of a sweet minty smell and I've seen good feedback on it but it was not that great for me. I find it just OK. Julep takes the round. Julep's cream is 22.00$ for 60ml but can be included in a monthly box and actually is the item included in the first 1 CENT box by Julep (my first Julep post HERE) along with 2 nail polishes. You can click on the right side picture link to get taken there if you want to sign up. Alessandro Intl's cream is actually kind of hard to find because I don't think Glossybox (the beauty box that included this sample, see that post HERE) sells stuff on their site... But it should be 20$ for 100ml, so quite a lot more product than Julep for 2$ less. Alessandro takes the pricing round at regular price. Julep takes it ultimately for being available but also for their amazing promotion. I really enjoy both creams quite a lot and was glad to have the chance to try them both out rather inexpensively. Julep's might come out a tiny bit ahead as far as which I'd prefer to use if I took nothing else than the product itself into account but it's a personal preference based on the smell more than anything else. My final thought though is that for me, personally, they are too expensive to buy full price. I'm hoping Julep comes out with a nice promotion for their non-polish products soon because I really enjoy them and would take advantage for sure given the right promotion. I will write a post if they do. It would make signing up as a Julep Maven worth it even for people not too enthusiastic about polish and they can always cancel after the first box and taking advantage of a non-polish Julep promotion. I might just be dreaming that this will happen though! 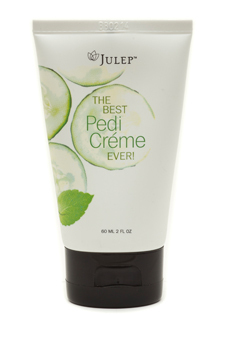 i've heard good things about the julep pedi cream but i skipped that box so i didn't get a chance to try it. i really like the alessandro cream... i'm nearly done my sample. i also have the curel foot therapy and i feel it's a very good product with a reasonable price point (around $3.99)... have you tried that one? That's a great price and I will definitely have to check it out soon! Thanks for suggesting it, I haven't tried. I think it came in a beauty box before I subscribed, is that possible?